During daylight Hours, when we shot these fine photographs of the Main Theatre Hall , the Zheng YiCi retakes the calm of an Ancient Qing Era Temple. 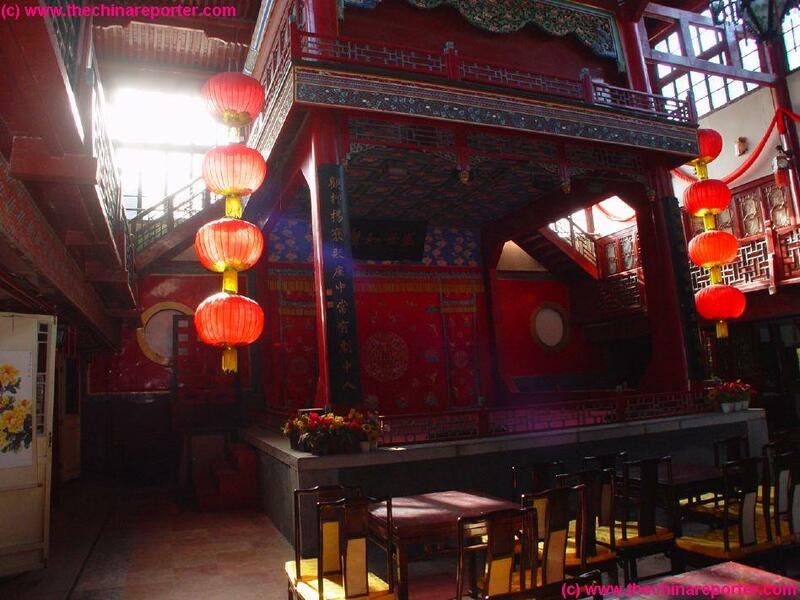 In ancient Times the Zheng YiCi indeed was a Buddhist Temple. Nowadays, in many respects it still is. Richly decorated in Imperial Dark and Flamboyant Red, the Theatre now is a shrine to the Arts of Peking Opera. paintings of stage scenes, Opera Masks and other paraphernalia, the visitor is immersed in a complicated Mix of Styles and Impressions. Ever the More so during a real Life Peking Opera show. Which can be, to say the least, an intense experience. Especially the sound department adds considerably to the thrills raising at times quite the astounding noise level. 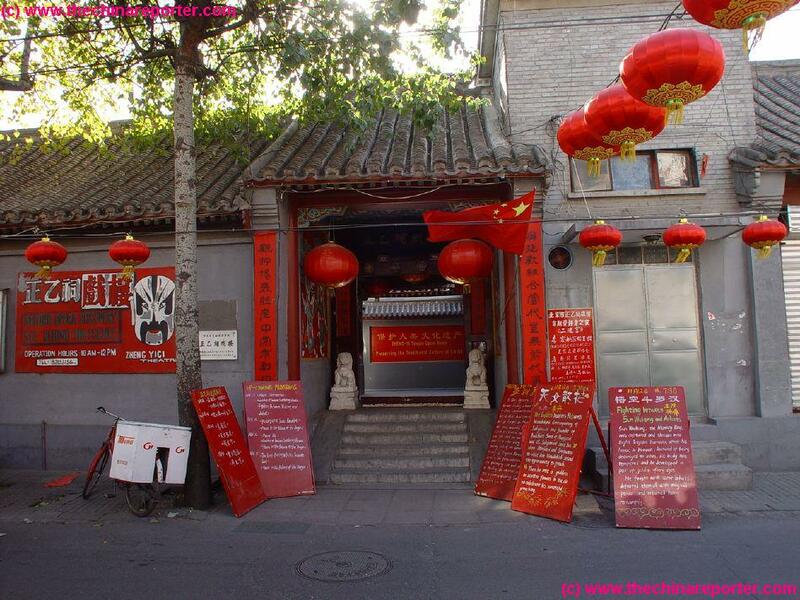 Located in Xuanwu District at the center of Beijing, South and near to Tiananmen Square , Dashilan Street and not far from Heping Men (=Gate of Peace ) and the colorful Liu Lichang Shopping Street . 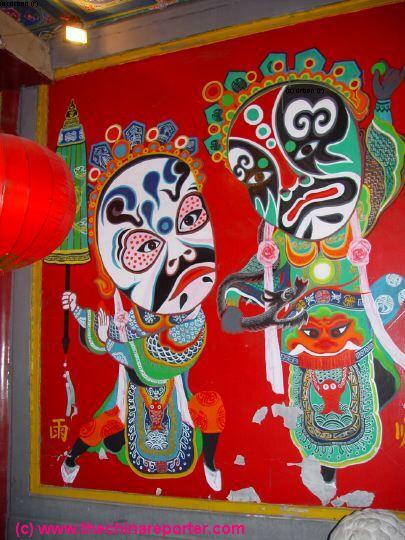 The Zheng YiCi Temple Peking Opera Theatre is very close to Beijing's City Life and home to delightful Peking Opera. The Theatre, dating from the Year 1668 AD, is housed in an ancient Ming Era Temple and is the oldest wooden theatre in China today. Not only that, but The Zheng Yici has the name as the best place in the City to enjoy Peking Opera and Kunqu Opera in its most authentic shape, form and most importantly atmosphere. Placed beautifully, but somewhat inconspicuously in the Xuanwu Districts " Hutong ", in and of themselves a very interesting and delightful area to stroll in the evenings, the Zheng YiCi Theatre is home to some of the Best Peking Opera Actors and opens its doors to Peking Opera-lovers, Locals and Tourists to share an interesting and unique Opera Experience. With the complete permission and with the warmest compliments of The Zheng YiCi Beijing Opera Theatre www.drben.net and China Report proudly present to you : The Zheng YiCi Temple Peking Opera Theatre , A Digital Report and Impression. 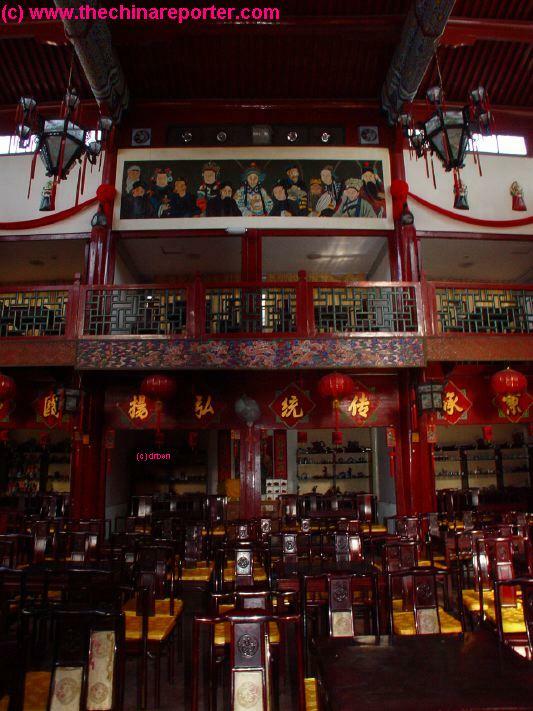 The Zheng YiCi Theatre is an ancient wooden structure with more than 300 years of History. 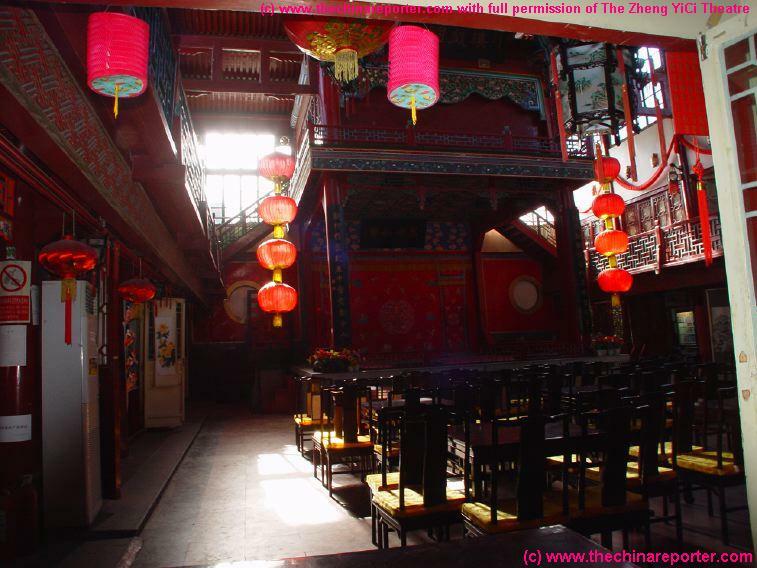 Inside of Beijing's Hutong, the area's surrounding the Theatre, it is said that this is Beijing's oldest wooden temple built in the Ming Dynasty (1368 AD - 1644 AD). The Zheng Yici Theatre's grounds were originally the site of an ancient Temple dated to an as yet unknown Era. In the year 1667 AD, during the prosperous reign of the Kangxi Emperor (Reign: 1661 AD - 1722 AD) of the Qing Dynasty, a new Temple was built on the Old Site. Finance and construction was footed by a group of merchants from ShaoXing in Zhejiang Province, one of the area's grown wealthy under the Qing Dynasty Regime. 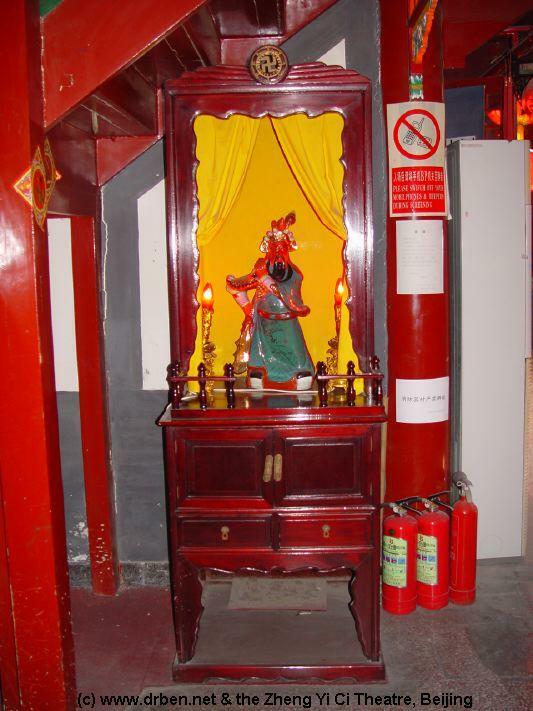 Peculiarly and unusually facing North rather than South, the Temple first served as an ancestral Temple for wealthy Zhejiang Merchant Families and so was also used to make offerings to the God of Wealth, Zhao GongMing Zhao. 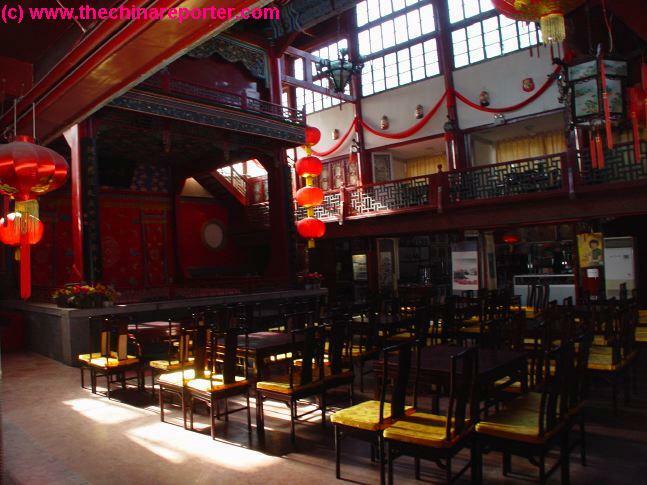 The Zheng YiCi Theatre is an ancient wooden structure with an all covering wooden and tiled roof. It has a central entrance facing North, not South. The Theatre's front and North Face measures five rooms, running along SiHeYan Lane. The Temple was reconstructed into a Theatre during the Late Qing (Ching) Dynasty , under Emperor Guangxu (the Reign of Empress-Dowager Cixi), at a time when Peking Opera was a very popular stage-art, especially so among affluent members of the Feudal Elite and the Qing Dynasty Court. Empress-Dowager Cixi (the real power on Guanxu's Throne), for instance, regularly enjoyed Opera plays at the Imperial Palace. For its long history and historic as well as cultural value, The Chinese Encyclopedia lists and names The Zheng YiCi Theatre as a complete preserved Theatre Architecture. With its Age, the Zheng YiCi Theatre is older than many of the World's Most Famous Theatres , including The French Comedy Theatre in Paris and the Kar-Vine Park Opera in Britain. 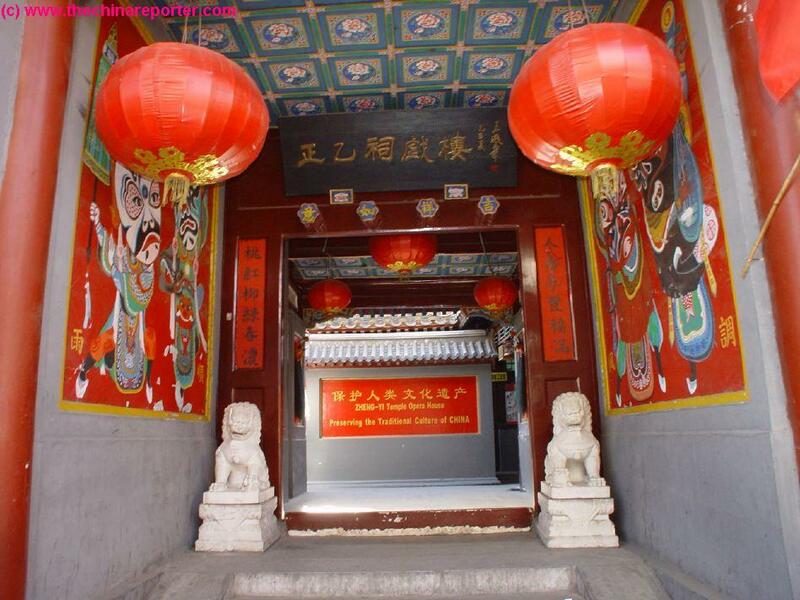 The Zheng YiCi Temple Theatre is the only well-preserved wooden-structure theatre in Beijing. It has a name of being a Milestone in Chinese Theatre Developing History and is credited by some scholars as being a living Fossil in Chinese Theatrical Cultural History. Zheng YiCi, with its rich Cultural and even greater Historical Value cannot be missed on a proper Tour of - or Meeting with The City of Beijing. It still is the most original, ambient and romantic Peking Opera experience in Beijing. The Zheng YiCi Temple Theatre - Preserving the Traditional Culture of China. 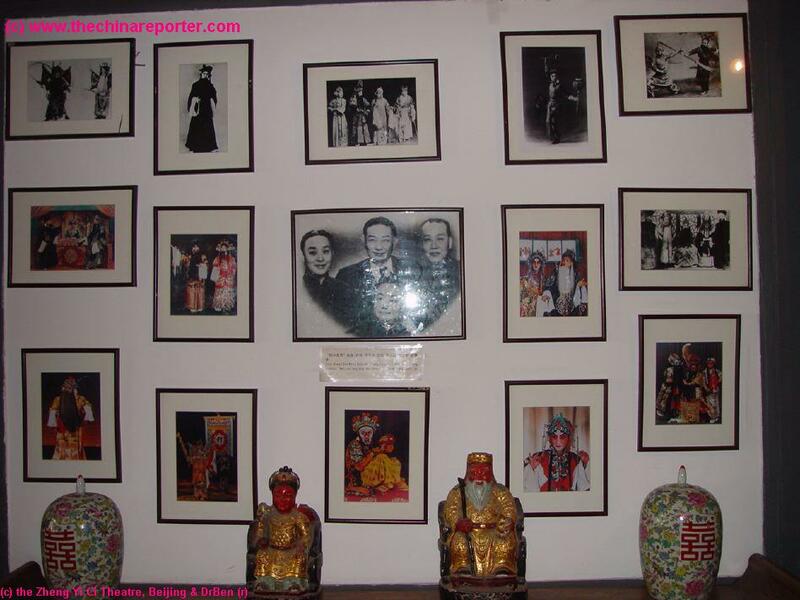 In the Hallway, apart from a rich Taoist Display of Gods and Figurines, a proud display of a more recent History. Photo's of famous actors from the Past. Daring deeds and monumental achievements in the Theatre's rich History. As a Centerpiece to the Collection, photo's of "The 4 Great Dan Actors". Traditionally , in Peking Opera, female roles were also played by Male Actors. They were the "Dan"Actors, males playing leading female roles. These 4 gentlemen were some of Beijing's and China's Finest. The Theatres all wooden structure is made from a high grade Chinese Rosewood. Furniture and Interior, including the ceilings, are all delicately and colorfully painted and crafted in the Ming Style also found at the Imperial Palace (Museum). Note the bright painted ceilings and the lavish use of the color red. This color represents a wish of Luck. 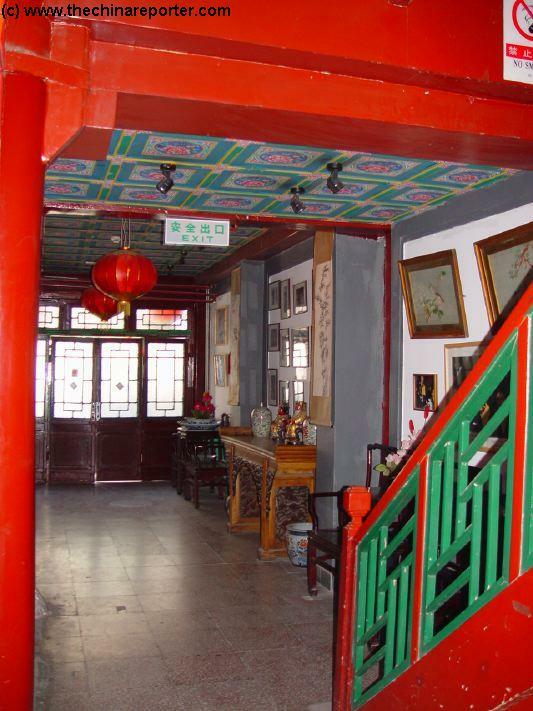 Hallway, here depicted, is his sort of Personal Taoist- and Peking Opera- Shrine. It is with the utmost of pleasure , and with the personal proud compliments of The Zheng YiCi management, that China Report presents this unique photo report. Every evening around the week (19:30 - 20:30) The Zheng YiCi Theatre stages its interesting shows from The Peking- or Kunqu-Opera traditions. As is obligatory in Peking Opera, there is Live Music with the Plays. Musicians sit at the Right of the Stage and play traditional Chinese instruments. There are the Hu'qin a 2 stringed viola , the Erhu', a 2 stringed low toned fiddle, and the Yueqin' a sort of 4 string guitar. Other instruments are used intermittently. There are no written lines of music concording with the play. NO SMOKING ALLOWED IN THE THEATRE OR HALLWAYS. More backgrounds on the Actors and Caracters in Peking and Kunqu Opera. Zheng Yici Adds. The Gentleman in the Middle of the Back row is China's most famous Peking Opera Actor ever, Mister Mei Lanfang. "Immortals" of the Art of Peking Opera, Mei Lanfang is credited with his own style of acting, the "Mei-school" , with smooth, perfectly timed moves and poised style. 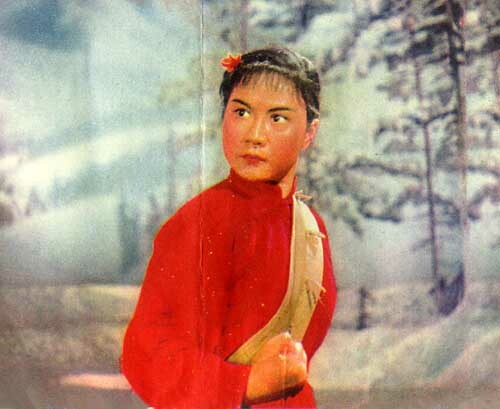 Furthermore Mei Lanfang is the writer and model Performer for many of Peking Opera's intriguing Plays and is generally seen as the "Dan"-specialist of all time. 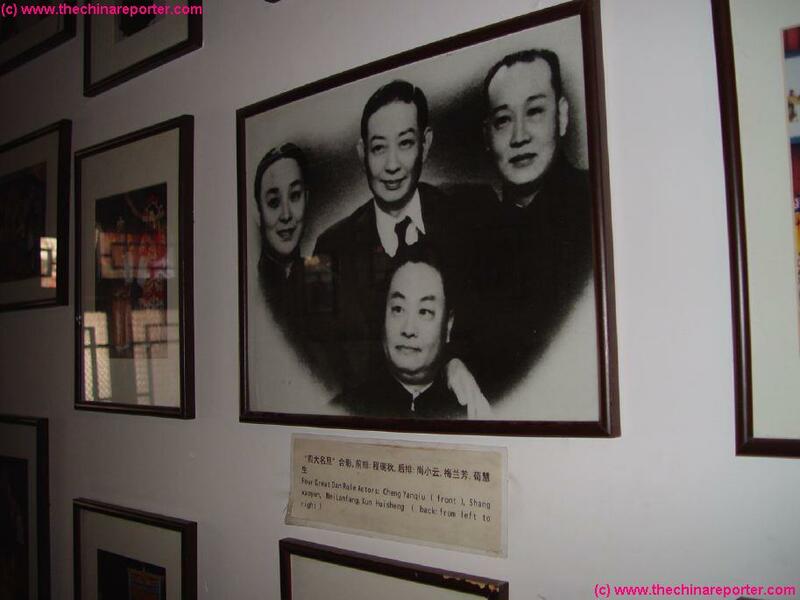 During 1950's and 60's when he had residence in Beijing, Mei Lanfang regularly performed his "Dan"-role acting at this Theater. With him (and other famous actors) overtime The Zheng YiCi Theatre became an intricate part of Chinese Cultural History and Tradition. As is obvious, the Zheng YiCi Theatre is very very proud to count him among a long row of excellent Actors to perform at their Theater. Although Master Mei is long gone, today his beloved Art is once more restored to its rightful position as an art of the Chinese People. Mei Lanfang's strong continuity combined with his ever searching for new techniques have made him a legendary star. After his death in 1961 Mei's wife donated his artistic collections and many other relevant belongings to the State. Since 1965 Mei Lanfang's Residence in Beijing's western XiCheng District has been a national museum which today is open daily, and features a variety of Mei's handmade costumes, scenes from performances and a collection of Mei Lanfang calligraphy, another one of his passions (For more - read the China Report on the Museum by Ben Nijhoff). Ever since his plays and moves have been carried forward in the great tradition of Peking Opera (JinYu) (and Kunqu). In 1995 The Mei Lanfang Peking Opera troupe was established which now travels the world and already has won several international awards. Opera Theatre at the Jianghuo-QianMen Hotel ( although a great show ) just cannot offer. Playing a different show every night , visitors are offered a Variety of Traditional plays which are a Good Introduction to Chinese mythology. To follow this however, some study of Chinese Opera plays up-front is advised. Mostly - we are taken back to such era's as the Three Kingdoms Period, and are witness to the drama's of Kings, Queens, armies and thorny Gods. The Rich Colors and setting of the Zheng YiCi Theatre , in the Oldest Wooden Theatre in the whole of China, combined with the excellent , impressing and joyful plays by the Zheng YiCi Theatre's home actors make a Visit to the Theatre and the watching of a show a Unique experience of Chinese Culture. Among Chinese Cultural Scholars the Zheng YiCi is famed as a living relic of Peking Opera Art. It is the only remaining original podium hall today. Note from The China Report: Nowadays Female Roles are Played by Female Actors and "Dan" actors are rare. 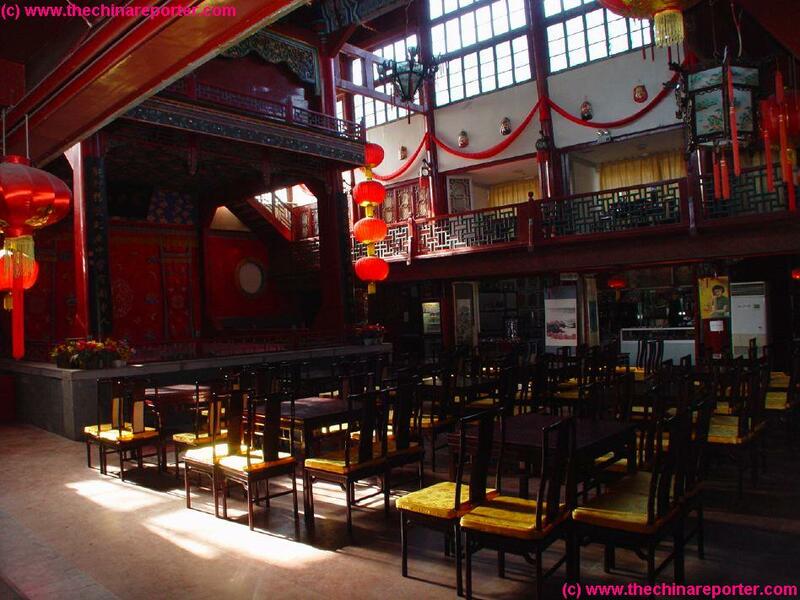 The Zheng YiCi Theatre has been Closed for Interior reparations and re-decoration since November 2004. No new opening Date is known to Us, but the Theatre was still closed in May and November 2005 during the Theater- and Tourist-Season. The Masters of Peking Opera - Cheng Fanqui, Shang XaoYun, Mei Lanfang and Xun Huisheng. 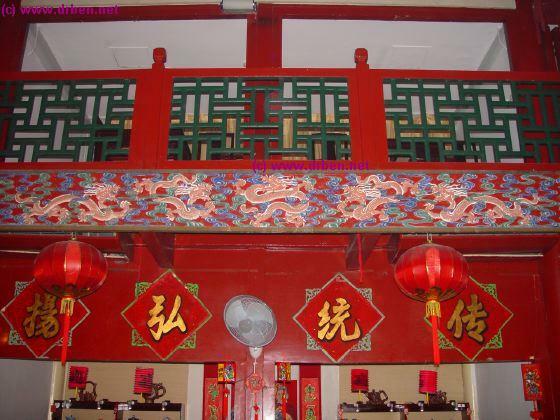 Marvelous Colorful Decorations flanking Zheng Yici Theatre's heavy Front Gate. 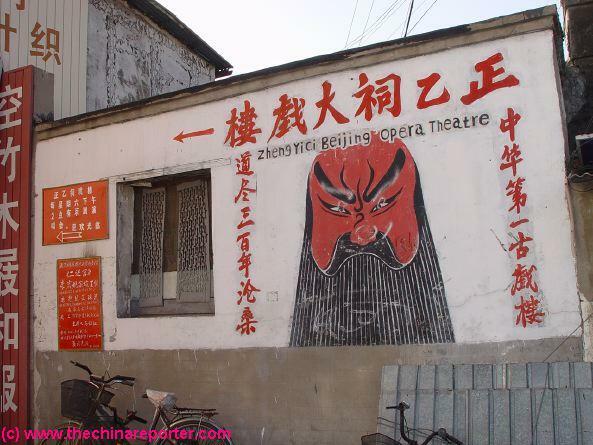 One of the Fantastic Zheng Yici Theatre Advertisements of the Past, in the Hutong of Beijing. Sadly, however, with the demise of Feudal China and an end to many traditions, a period of steady decline set in for China, the Chinese affluent and thus also Peking Opera. The Art of Peking Opera severely suffered from the lack of finance resulting from China's economic and international crises. In the warlord days and even during the Japanese occupation, the art lived on, albeit on far lesser stages than the earlier feudal Mansions and the Imperial Palace. Master Mei was almost single-handedly responsible for a short revival in the 1920's, however, after this period Peking Opera was more or less restricted to a home public. A large audience still. The Art of Peking Opera was further decimated during the politically over-correct period of the Cultural Revolution, when it was somehow branded as traditionalist and thus politically wrong. 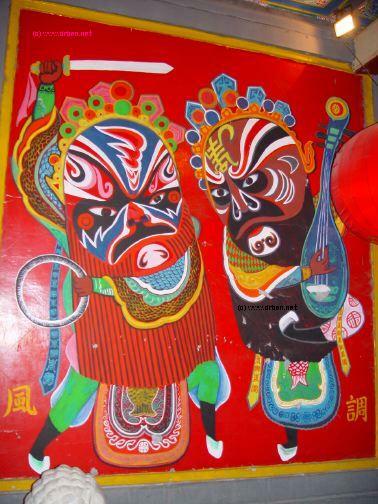 Interestingly in the 1940's, the Folk Arts had played and important role in spreading the message of the initial revolution through to the rank and file all over China (Truly an intrinsic part of the party propaganda machine), however, during the 1960's it was felt that Peking Opera glorified the Feudal Past, made heroes out Emperors and oppressive landlords and thus should be disposed off as foul and incorrect message to "the masses". of Peking Opera, carried warmly in the hearts of the people, refused to die. Themes with those of proud Chinese conquering Japanese strongpoints and other heroic feats. Naturally, they were an instant success. in Paris and other world cities, the art of Peking Opera became world famous, even appearing in films. It was in this period that Master Mei also performed at the Zheng Yici Theatre in the Xuanwu District Hutong of Beijing. However, all this was too little too late for the Zheng Yici Theatre. Due, among things, to a loss of traditional identity among the common peoples, the Zheng Yici never returned to full function. Peking Opera stages in Beijing remained few in number and small in size. 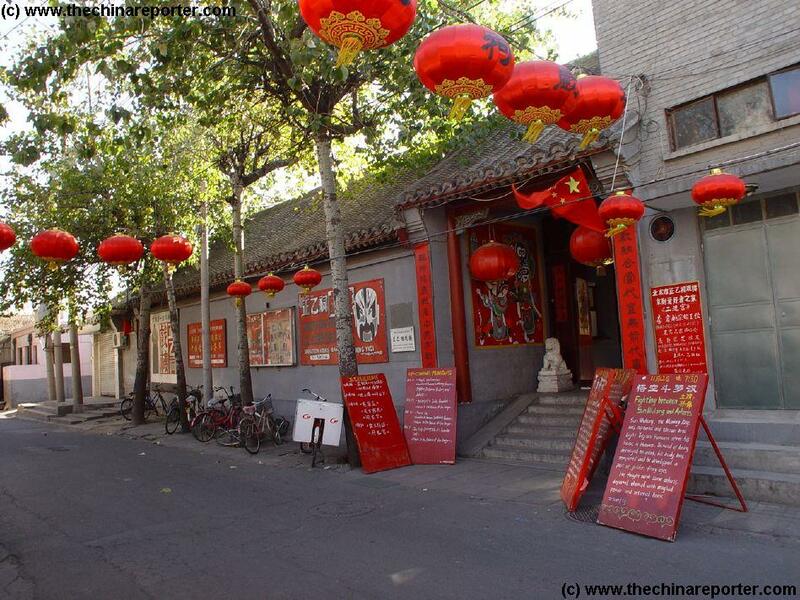 Further, the general poverty of China and thus Beijing kept the Zheng Yici Theatre from renovations and reopening. The Old wooden Temple remained closed, unused and rotting, hidden and forgotten in the Hutong just North of Liu Lichang Street. Revolutionary Peking Opera's died out and throughout the 1970's and Eighties Zheng Yici Theatre awaited better times. 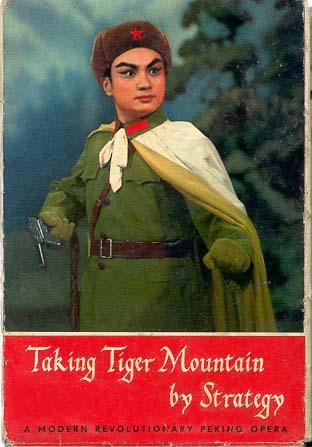 Cover of "Taking Tiger Mountain by Strategy"the Book. It feautures full photos of the Original Stage Performance and was available in Chinese and even English. Revolution, launched the opening-up policy for China. China's economy was immediately on the incline, and finally much needed tourist guests were arriving, all longing for traditional performances and arts like the Peking Opera. In 1995 , after a long period of disrepair, a local businessman with a passion for the Art of Peking Opera took an interest in the somewhat destitute Theatre. In hope of reviving the then dying art of Peking Opera it was restored to its former glory and the best actors were sought for and contracted. The Rich History of this Place ensured no lack of interest from both artists and spectators. Ever since The Zheng YiCi Theatre and Peking Opera have once again thrived in the City of Beijing. Spectacular scenes from "Taking Tiger Mountain by Strategy", THE Revolutionary Peking Opera. A Flank view of Zheng Yici Hall, visitor seats and Peking Opera stage. The small all-wooden passageway to the Main Hall and the Opera Staff. Decorations abound. 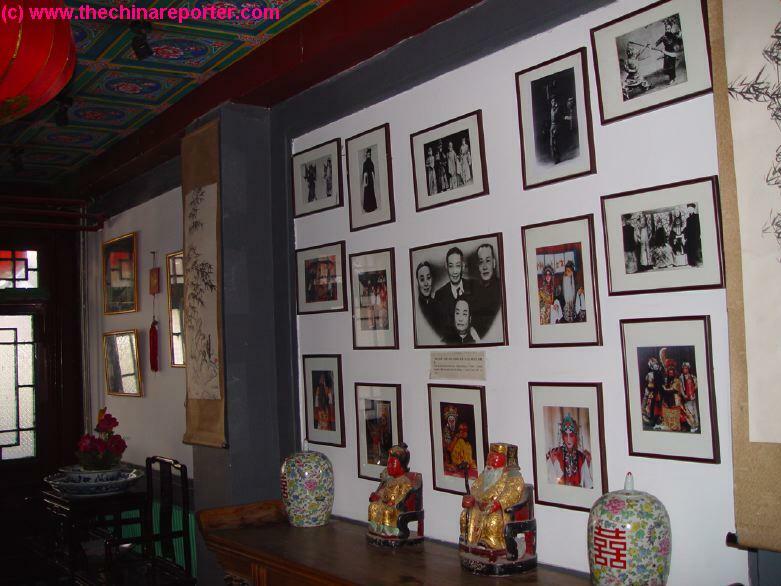 Display Wall featuring Past and Present Glories and successes of the Zheng Yici Theatre of Beijing. It is an impressive array of Stars. 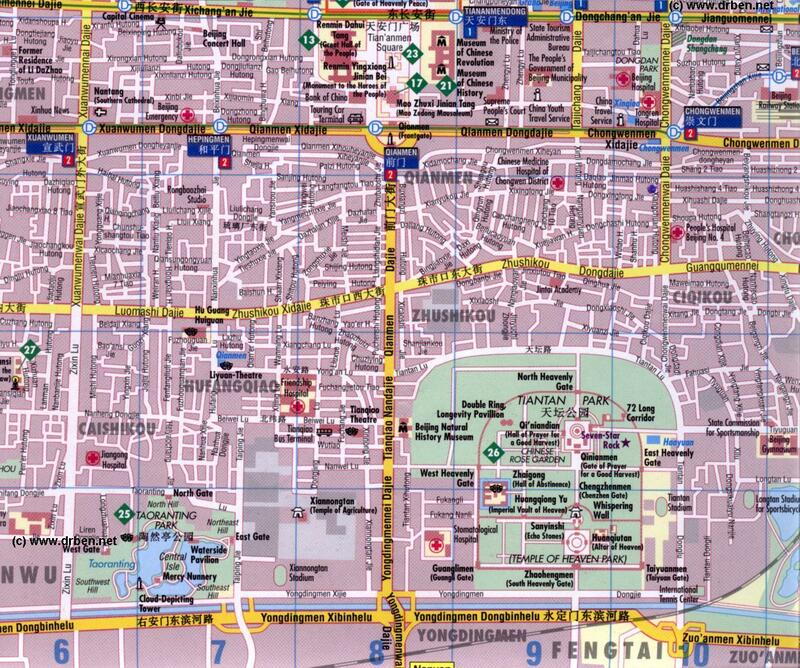 Map of the Southern Districts of Beijing giving the location of Zheng Yici Opera Theatre in the Hutong. The Eight Model Works of Revolutionary Peking Opera - A compilation of all plays with bonus interviews and historic footage.